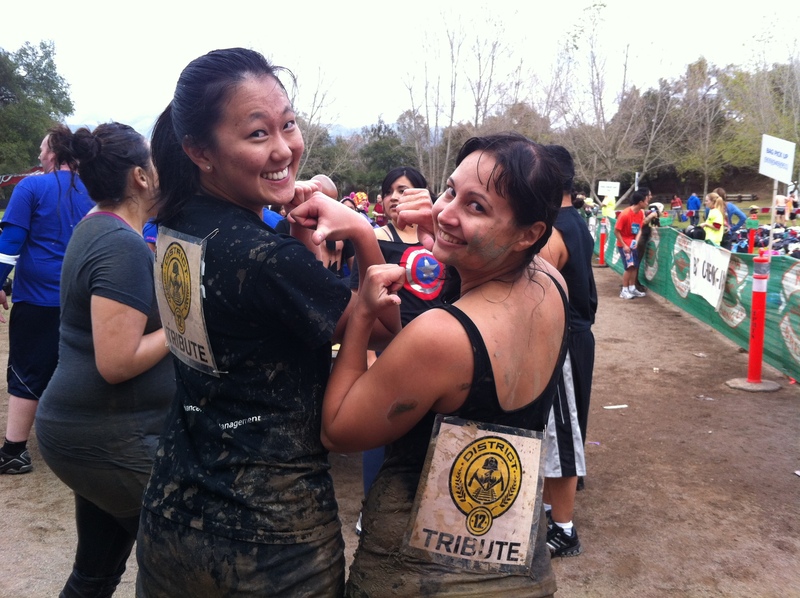 Back in April, Kat and I purchased an online deal to do a 5K mud run at the Irvine Lake. To prepare myself for the run, I bought a gym pass at Total Woman Day & Spa from Groupon. It was only $25 for one month which I thought was a pretty good deal. It was pretty well worth it because I took my first Zumba class there! If you have yet to take a Zumba class, please go for it! It is so much fun with the instructor being so energetic and everyone else is into it. You definitely get a good work out from it since it just keeps you moving. So for several weeks, I went to the gym to build up my endurance for the 5K run. It was definitely challenging. I commend those who have done more than a 5k run. To build that discipline and endurance takes a lot of perseverance and self-motivation. I hope to do another 5k run and build that discipline too! 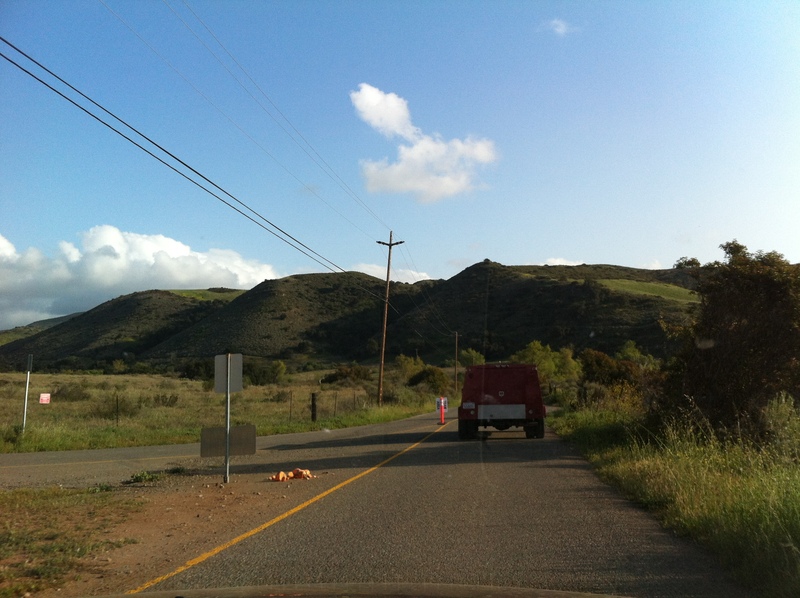 The Irvine Lake is hidden out in the boonies of Orange County. 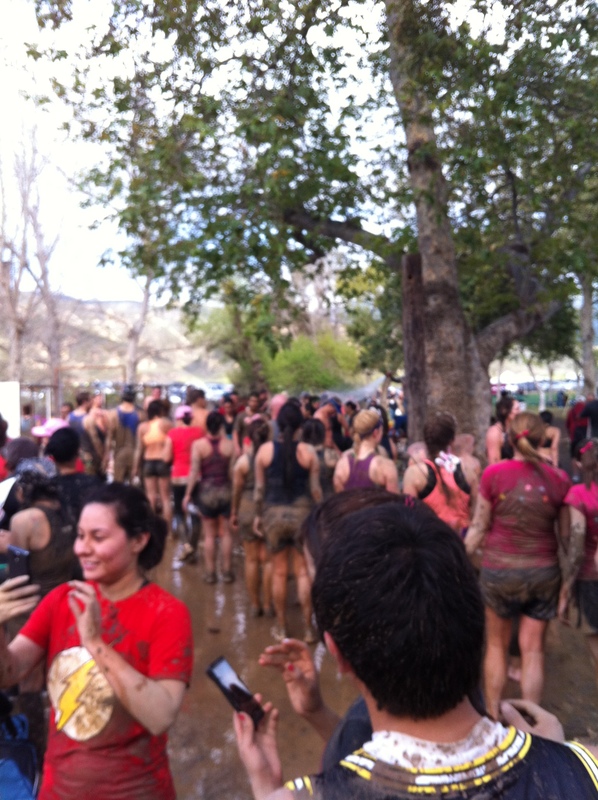 When we got there, there were so many people who were covered in mud (of course)! I knew what I was getting myself into but somehow I was getting nervous and excited about the mud! After roaming around, we decided to stretch and stand in line for the race. Beautiful view of the Irvine Lake area. 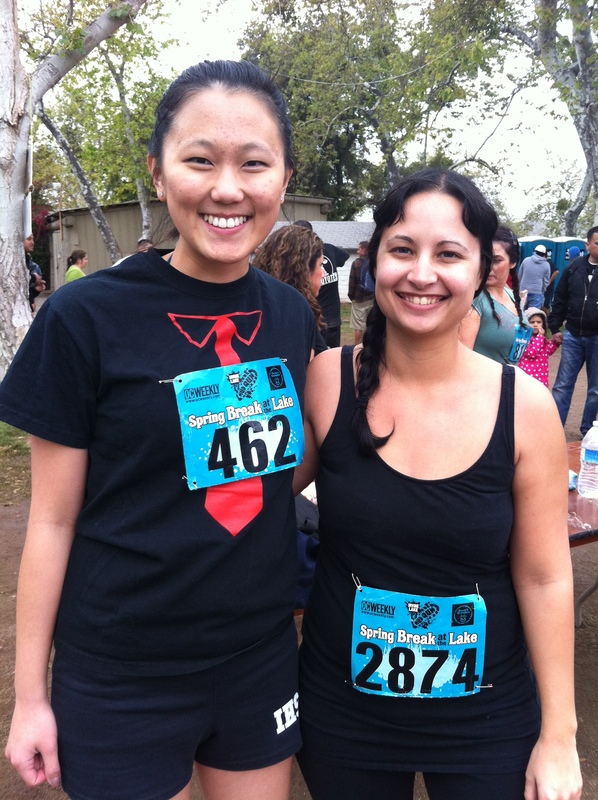 Kat and I completely spotless before the race. There was a host at the starting line who pumped up all the runners and did a count down for the race to begin. Three…two…one….GO! We ran up a small hill and then down the hill we had to run through our first muddy area. There was a pool of muddy water that went above our knees and it was cold! We screamed and laughed as we were walking through the mud. Throughout the course, there were various obstacles where you had to hike up a muddy hill or crawl under a net in the mud. There was a mud slide where you slide through a tunnel and land in deep pool of muddy water. At one point, there was mud which was in clay consistency. This section of the course was probably one of the most challenging and fun part of the run. I literally could not walk or run on top of this mud because my shoes kept getting stuck in the mud! No matter how quick I tried to run through this mud, my shoes got caught. 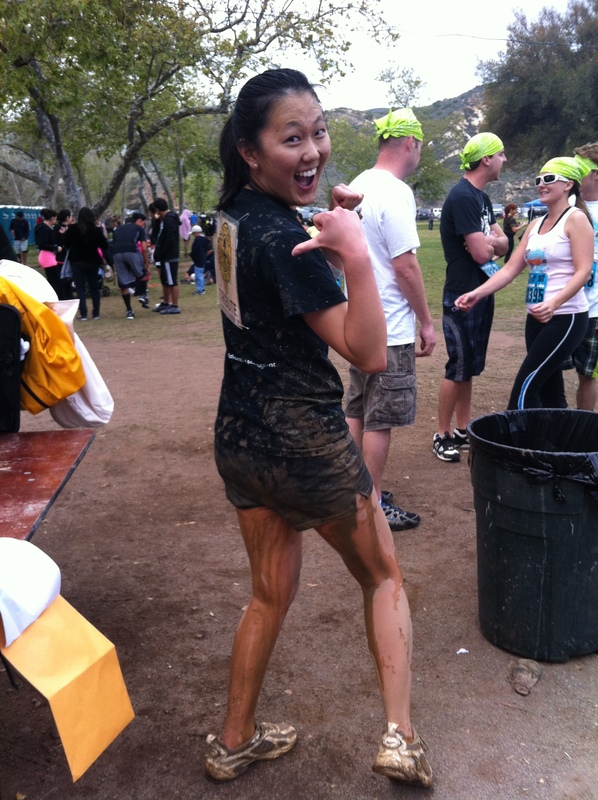 So I had to surrender to the mud and started crawling on my knees like everyone else. Once I was getting close to the end of this clay mud area, I was getting ready to get up. Unfortunately, I couldn’t get up like I wanted to because my left shoe got stuck in the mud. I tried to pull my foot out but I ended up having to take off my shoe. Even then, I couldn’t take the shoe out! I thought I was going to have to run without one shoe but luckily, a random runner ended up saving my life. (Thank you random mud runner!) Without him, I would not have finished the race with two shoes on. When we were getting close to the finish line, there were volunteers on the side cheering us on. It was really encouraging to have them there since the mud run was challenging with all the obstacles. Kat and I finished the race in 1 hour and 40 minutes with soaked muddy shoes. We were standing in line to rinse ourselves from the mud. They had shower heads lined up for people to rinse off. In the far back, someone had a hose and just sprayed a bunch of people there. 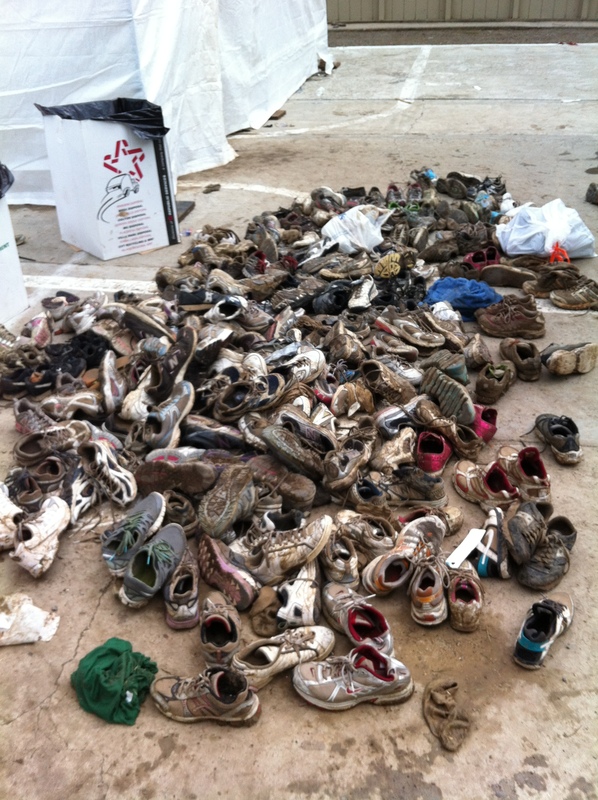 After the race, many didn’t want to take their shoes back home because they were muddy. 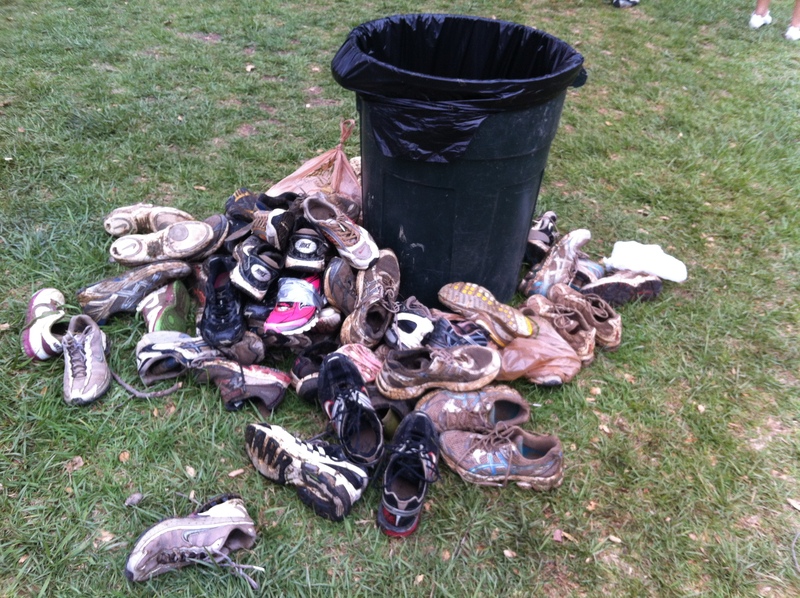 So here’s a one of many piles of shoes left alone. 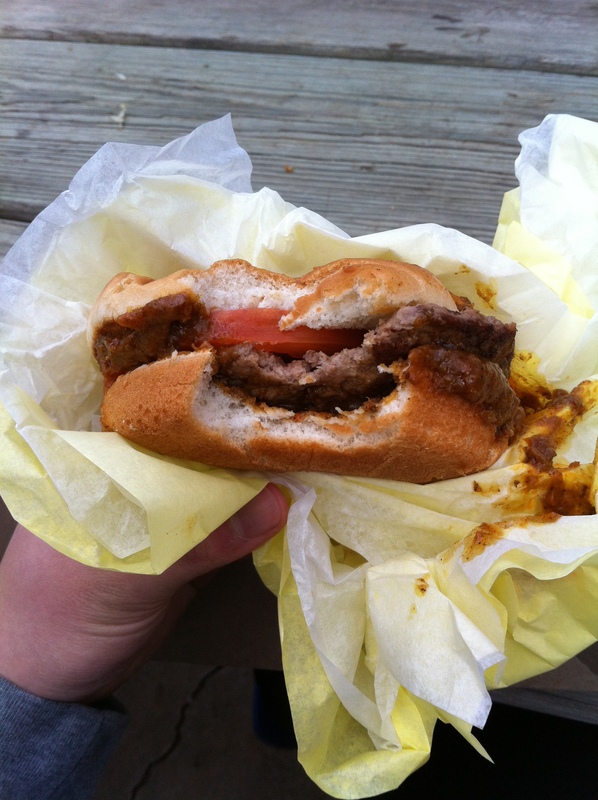 Warm food for gloomy weather after the race. 1. What’s your name? Don’t know my name yet? Lol, Katyanna Trujillo. 2. How do you know Tina? From the lowly throngs of work. 3. What do you spend most of your time doing? Everything.